Dumneazu: Yuri Chernavets: 1948 - 2018. Yuri Chernavets: 1948 - 2018. Yura Chernavets, my good friend passed away this month at his home in Tyachiv, Ukraine at age of 69. Yuri was the drummer, singer, and plonka player from the Manyo band (known in Hungary as the Técsői Banda) and he was - without any shadow of doubt or danger of hyperbole - the best damn traditional drummer in European folk music, a natural talent who developed a an amazing level of expressiveness and virtuosity on an instrument that is usually considered an afterthought. 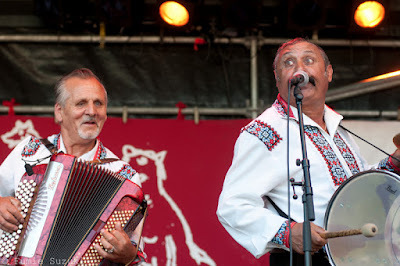 Yura was a member of the traditional folk band known in the Ukraine as Manyo, consisting of the sons of the Hutsul fiddler Manyo Chernavets, based in the small town of Tyachiv in the western Ukraine, just across the Tisa river from the Maramures region of Romania. Manyo play a mix of native Hutsul / Ruthenian music, a heady mixture of Ukrainian, Romanian, Hungarian, and Gypsy music with a healthy dose of Russian and Jewish songs thrown in for good measure. I met them around 2000 when record producer Ferenc Kiss and Imre Keszthelyi began to tour them around Hungary, showcasing their multiethnic repertoire. When I heard them play a medley of Carpathian Jewish dance tunes I arranged to visit them at Imre's sprawling 8th district flat, where they usually stayed in Budapest, with Australian cimbalom player Tim Meyen and fiddler Pip Thompson. We ended up recording a huge amount of music, much of it Jewish, but the day cemented a personal relationship that grew over the years. During that afternoon we were warned to keep the music down so that the neighbors wouldn't complain: this is Ivan on fiddle and Yura playing on furniture, and you can see the artistry coming through, as well as a few of his dance moves. I had intended to include some of their tunes on Di Naye Kapelye's third CD for Oriente Records (Traktorist) but had to contend with post touring and studio exhaustion from my own musicians, when the Manyo band suddenly showed up in Budapest. So I simply invited them into the studio to do the songs with me, as well as Michael Alpert's rendition of the traditional tune "Hu Tsa Tsa" sung about the Chernobyl nuclear disaster. At the time the band was involved in making Hungarian documentary which became "The Last Kolomeyke" (whole film on Youtube) That film, sadly, became the story of the loss of their brother Mishka, the cimbalom player, but I allowed the film crew in to the studio to record the session and later we did a live gig at the old Castro Bistro in Budapest. In the clip from that film you can hear - but not see - one the of Yuri's amazing talents: he was a master of the plonka, The plonka is a small bit of film - from a slide or an e-ray - held in the mouth and blown as a reed for effect during dances, tweeting like a bird, trilling like screeching brakes, or - for a talented few like Yuri - playing melodies like a crazed oboist on meth. Some of my fondest memories of Yuri are when I went with the band to New York for the Black Sea Roma Festival sponsored by New York city's Center For Traditional Music and Dance in 2010. For the first few days we stayed at my sister Pam's house in New Jersey, where we invited the cream of the New York klezmer scene - Michael Alpert, Sruli Dresdener, Zach Meyer, and Pete Rushevsky among others - for a BBQ and jammed until the police advised to stop. Later, the Center for Traditional Music and Dance sponsored a dance party at the Ukrainian Home restaurant on 2nd Ave in the East Village, giving the band the distinct impression that much of New York was inhabited by Ukrainians. While we were in New York ethnomusicologist Shaun Williams - who was teaching English in the Ukraine at the time and studying Hutsul traditional music - served as cimbalom player and translator, and basically, cultural advisor to the band ("no, they don't shoot the chipmunks and eat them here... yes, the coffee samples at Starbucks are for free...") While we were all shopping for fiddle strings at DiBella music in Bergenfield, Shaun pointed out that that Yuri had fallen in love with a three wheeled motorcycle parked behind. Yuri Chernavets was a lot more than just a folk musician - he was a world class musician and many promoters and producers who heard him live were quick to say so. A couple of years ago I was contacted that a producer in England had seen some of my video clips and wanted to record the band... and it was one of the members of PiL. Another musician wrote to me from Japan asking about Yura and his drum style. For Klezmer musicians, who play the Carpathian poik drum, Yuri was one of the only practitioners of poik who really had a mastery above mediocre levels. The Hutsul discovery of NY pizza. Traditional musicians like Yura and his brother Joshka of the Manyo band are one of the reasons I continue to live in this part of the world. They are still here. I am still here. Something bigger than us is still here. Tradition doesn't just mean preserving the past. Tradition is a way of protecting the future. It is a way of giving something that you can't quantify with a price, something you can only have if you work for it, but you can never own it. Yura was a person who worked for everything he had, and shared with everyone he met. We are all better for knowing him, we will miss him, and Heaven will now be a much livelier and noisier place. i just wanted to say i love this blog. i think i've read the whole thing! i revisit older stories often and am always very excited to see updates, even these last two very sad ones. all the best to you, from a longtime fan. I also have wonderful memories of Tecso Banda’s visit. My condolences, Bob. This is sad to hear, we will miss him. He was a real performer, who could capture a whole audience without a word, just with that smile, that intense twinkle in the eye. Pretty magical. Such people are rare. Thanks for letting us know, Bob. I really like your last paragraph, about what tradition means.